Two years ago, the first Android Wear watches rolled out as unrepentant nerdware. Since then, Google’s smartwatch platform has been embraced by mainstream fashion and lifestyle brands, and today we have much more fashionable options from TAG Heuer, Fossil and Michael Kors. And then there’s the Nixon Mission, a ruggedized $400 Android Wear watch designed specifically for snow and water sports. Dude. This watch is actually pretty cool. I neither shred nor surf, so I couldn’t get any immediate use from Nixon’s custom software, which provides a bunch of data on surf and snow conditions. But I still like a lot of what the Nixon Mission brings to Android Wear’s table. The 48mm case may be huge, but at 3.7 ounces, the Mission actually weighs less than the more fancy-lad Michael Kors Access, which hit 4 ounces on our postal scale. The Mission will dominate skinny wrists, but it’s remarkably comfortable for its size. The Unit watchface shows just the basics, along with current temperature, and whatever the hell animation is going on in the lower left. Nixon eschewed an all-metal design, and instead opted for a shockproof polycarbonate case topped by a surgical-grade stainless steel bezel. The result is a sporty, purposeful look that pairs well with Nixon’s custom watch faces. The silicone band is quite comfy. You can choose from 24 different color options. My review specimen came with a brushed stainless steel bezel, but when you order the watch, you can choose from 12 different bezel looks—five brushed steel options, and seven matte cerakote options. The bezel is held down by four easily removed allen-head screws, but there’s really no reason to disassemble the watch, as Nixon isn’t selling the bezels as standalone items for customization. Nonetheless, I did remove the bezel to test its durability, and yep, the sucker is strong—or at least resistant to torque. The bezel didn’t bend when I tried to give it a purposeful twist, but it did suffer some nicks when when I whapped it with a metal ruler. Worried about durability? Well, the crystal is made of Gorilla Glass, and it’s also recessed a bit beneath the bezel. This should give the screen some extra protection if you slam the Mission against a river rock. The stainless steel bezel is locked down by four allen head screws, with a gasket sandwiched against the crystal. Most smartwatches offer some degree of water-resistance. For instance, if your watch is good for 5 ATM, it can survive splashes of water in the shower. But Nixon wanted a watch that could survive wipeouts and turtle rolls. Enter Nixon’s MicLock mechanism, which helps the Mission achieve a 10 ATM rating. In theory, this means the watch can survive submersion under 330 feet of water. A close-up of the microphone locking mechanism that helps the Mission achieve 10 ATM water-resistance. When you see the flash of red in the mic port, you know the lock is open. As the name implies, the MicLock covers the watch’s microphone port, the one point of entry where water can penetrate the case. You know the MicLock is open when you see a flash of red in the microphone port. To lock the watch down tight, you slide a little metal band off a tiny metal lever, lift the lever, shut the door that’s over the microphone port, and then refasten the band on the lever. The parts are small, and you better have some fingernails handy, but it’s all pretty simple once you do it once or twice. Thanks to Nixon’s MicLock, the Mission is water-resistant to 10 ATM—that means it can withstand the pressure of being about 330 feet underwater. I can’t promise that the Mission can withstand a full day of surfing, but I submerged it in water for 15 minutes, and it was none the worse for wear. The MicLock is certainly an interesting innovation that should appeal to Nixon’s target customer, and I love seeing Android Wear watches branch out into niche categories. That said, the Mission was less responsive to voice commands compared to other Wear watches. I don’t know if the MicLock or some other factor is to blame, but the issue was big enough to warrant mentioning here. Besides the usual assortment of Android Wear watch faces, the Mission comes with six custom faces. It’s a relatively small assortment, but if you’re interested in snow or water sports—or simply need to make a statement—the Nixon dials may be exactly what you’re looking for. Let’s start with Nixon’s Unit face, which is definitely the watch’s most aggro design. Vaguely reminiscent of the head-up display in Predator, it shows you day and date; hours, minutes and seconds; your local temperature; and an inexplicable animation in the lower left of the dial. You can choose between deep red graphics and a color that looks similar to what my favorite car manufacturer calls krypton green. It’s not the watch face you wear to the symphony, but that’s not Nixon’s scene, if you dig. The green-themed Unit face certainly has... a look. If you’re looking for something more traditional, you can opt for The Mission face, which is illustrated in my bezel dissection shot above. With this face, you can customize the colors of your background, hands and digits, and also define the data displayed by three subdials. I’ve chosen battery status, steps and local weather, but other subdial options include date, next calendar event, distance walked, calories burned, world time, a chronograph, and surf height or snow levels at predefined locales. To reiterate, I don’t do action sports. But I know a few surfers, and I think at-a-glance wave reports would be very useful in helping them decide when to suddenly fall ill and call in sick. 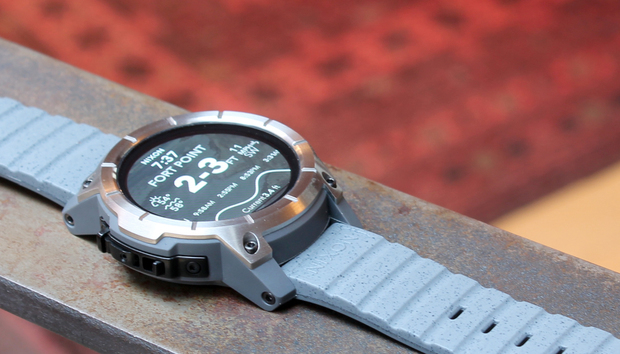 The Mission Pro watchface up close. You can define multiple surfing spots in your area, and then swipe through locations to see what’s happening where. Now, if you’re really serious about action sports, you can choose the Mission Pro watch face—which is barely even a watch face at all. As you can see from the image above, the current time is totally de-emphasized. Instead, the watch face hooks into the Surfline platform to deliver detailed data on local surfing spots, including current temperature and cloud conditions; wave height; wind direction and speed; and tidal information. Scroll down further on the watch face, and you can see information for tomorrow. If your interests are more geared toward snowboarding or skiing, you can set the watch for snow reports (powered by the Snocountry platform) instead. You’ll get data on the current temperature and cloud cover; wind direction and speed; new snowfall in inches; projected snowfall in inches; and details on base depth, open trails and open lifts. The Trace app pairs with an external physical sensor that you affix to your snow of surf board. From there, you can record a bunch of data from your sessions. And, finally, the Mission hooks into Trace, a sensor-driven platform for measuring performance in action sports. TraceSnow, for example, can track session time, calories burned, altitude, maximum speed and total distance. Aside from its aggressive look and action-sports leanings, the Mission is a fully modern Android Wear watch that advances the Wear story in some areas, but falls a bit short in others. The 1.4-inch, 400x400 AMOLED display looks quite sharp, but it’s not bright enough to be legible on clear, sunny days. The Mission has an ambient light sensor, but it doesn’t matter if you set the watch to auto-brightness or its maximum setting, it still can’t cut through direct sunlight. To this extent, I’d rather have a Wear watch with a transflective display. The Mission’s charger attaches with a relatively strong magnet, and has a durable braided cord. On the flipside, battery performance was impressive relative to other Android Wear watches I've tested. I never finished a full day of frequent, punishing use with less than 30 percent battery capacity remaining, and I often found myself making it through a day and a half without a recharge. The Mission comes with a 400 mAh battery, but the watch also benefits from the Qualcomm Wear 2100 processor, a chip expressly designed to consume less power. I also really liked the watch’s charging adapter. It snaps to the Mission with a strong magnet, and its braided cable feels like it’s ready to suffer some abuse. 512MB of RAM? Check. 4GB of storage for apps and music? Check. The Mission also has a built-in GPS, an essential sensor for various workout apps. Bottom line: The Mission is a perfectly fine Android Wear device. It even has some really nice features. But I doubt any “mainstream” Android enthusiasts—and, yes, that’s probably an oxymoron—will be buying the Mission unless they really, really like the Nixon aesthetic. But surfers and snowboarders who’ve already joined Team Android? I can totally see them digging the Mission and getting real value from it.